Once the walls had been painted, the furniture given makeovers, and decorative pieces put in place, it was time to organize! Since this room is used both as my craft space and our home office, I needed to find efficient ways to blend the two. I started by clearing out every drawer in the room. Every thing was placed in boxes to be sorted through. The next step was to clean out the storage closet. That was an all day task! Bins were emptied, sorted through and lots of items that should have been discarded ages ago finally found a new home in the recycle bin. Starting with a clean slate was key to figuring out how to best use the furniture and closet for storage. Below are a couple of photos of what the space looked like before I began this makeover project. I’ve mentioned in other posts about the makeover that the space was dark. It wasn’t an inviting space to work in and it did nothing to spark any creativity. I didn’t take any before photos of the storage closet, but trust me when I say it was a hot mess. 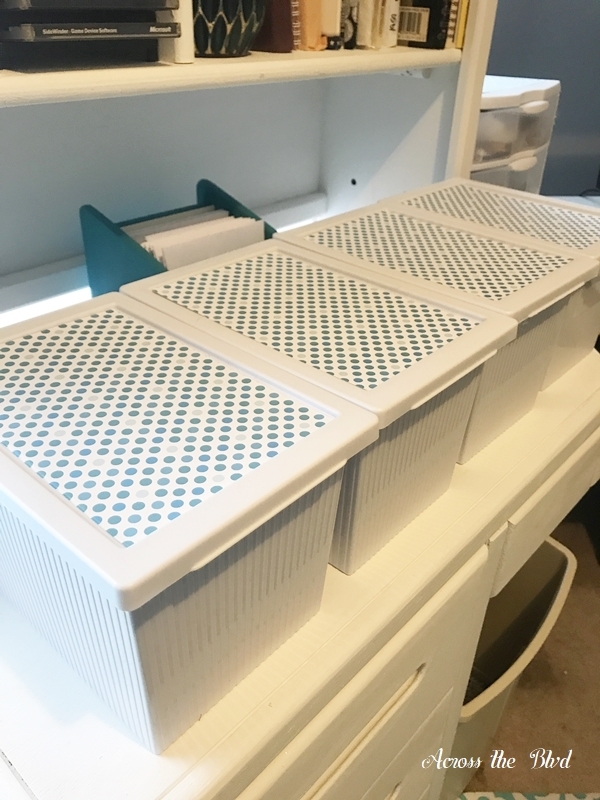 I use bins for storing craft items, but they were not organized and they were not easy to get to either. I had also gotten into the habit of just cramming items on top of the bins creating even more of a barrier to get to the items I needed. 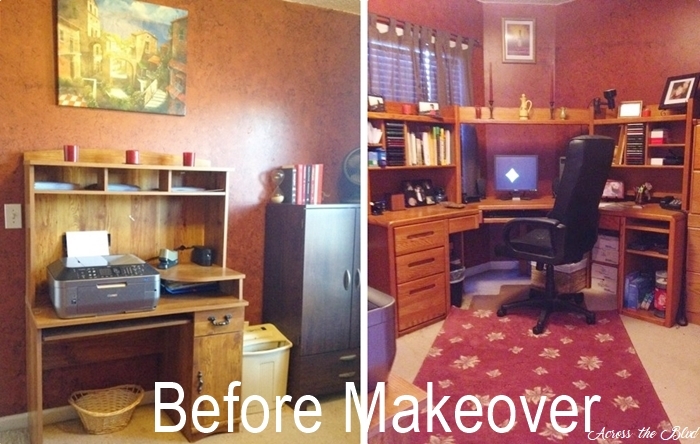 I started the makeover for this room in August and for the most part, it was finished during September. But over the holidays with lots of crafting going on, I let it get pretty messy. I spent last week adding a few more storage pieces to the space and giving the closet one more round of cleaning out and purging items that were just taking up space. The large desk is used primarily for our home office. 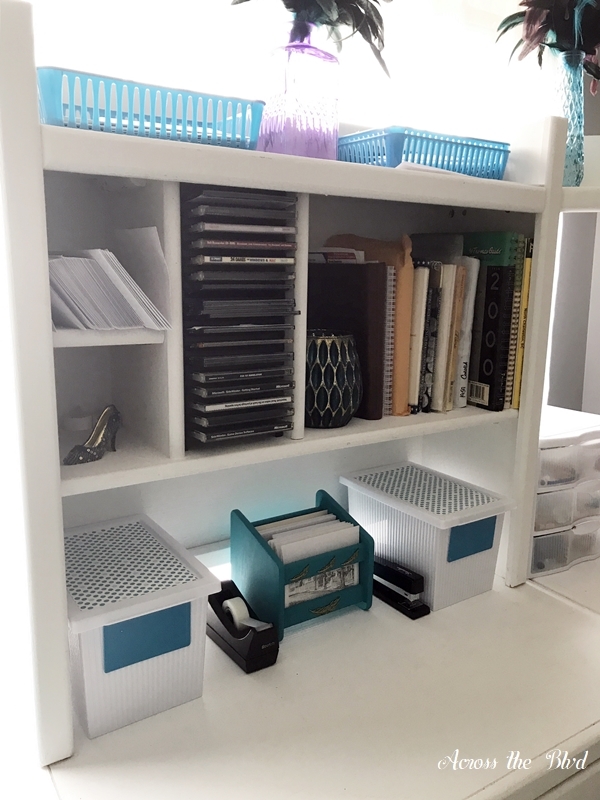 I do use the surface space for crafting, but the drawers and shelves are dedicated to items that relate to our home organization. I bought several small plastic baskets at the Dollar Tree that I used to hold bills, saved receipts before filing, and paperwork that needs our attention. These are all placed on the top shelves of the desk along with some decorative bottles and peacock feathers. These came from Michaels. The drawers are full of documents, important paper work, and file folders. Just because the desk is used for those items didn’t mean it I wanted to leave it plain. 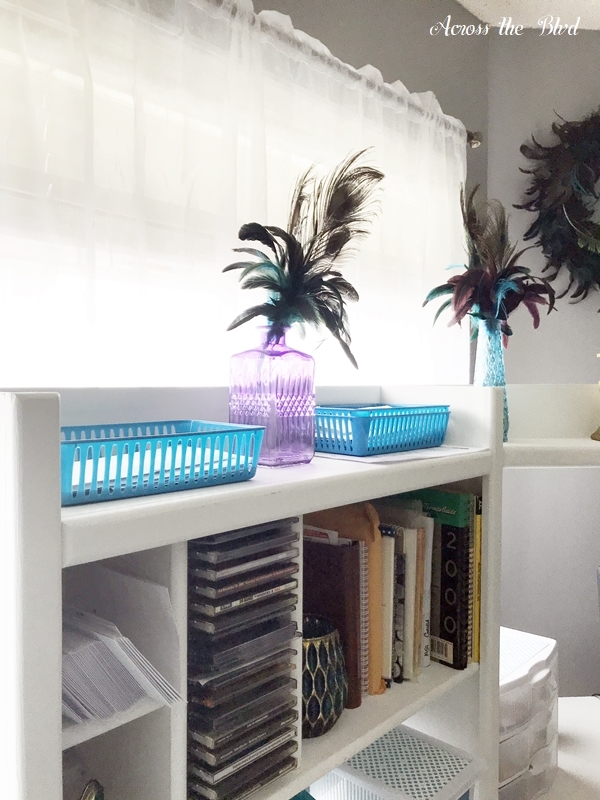 I wanted the space to have lots of peacock accents, so bottles with feathers, pretty jars, and a few other decorative items give the desk a fun look. I used card stock to give the small white containers a little color. The card stock is glued in place. Paint brushes and other crafting items are stored in the containers. Since the room is not a large space, I have to utilize as much of the floor space as possible. 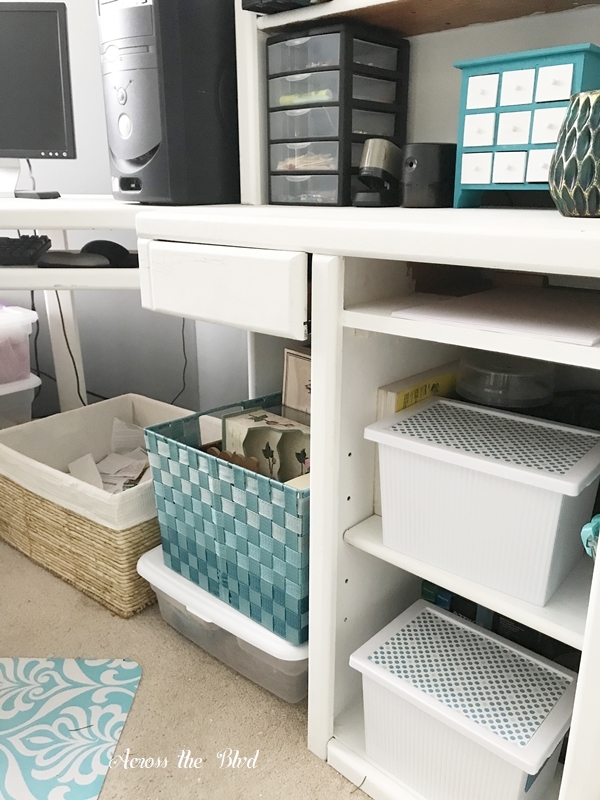 Tucked beneath the lower shelves of the desk are bins, a paper shredder, and a basket that holds items to be shredded. I also have a cloth bin that holds some of the smaller items that I’m currently working on. One of the things I wanted to avoid was having lots of clutter on top of the two desks in the room. 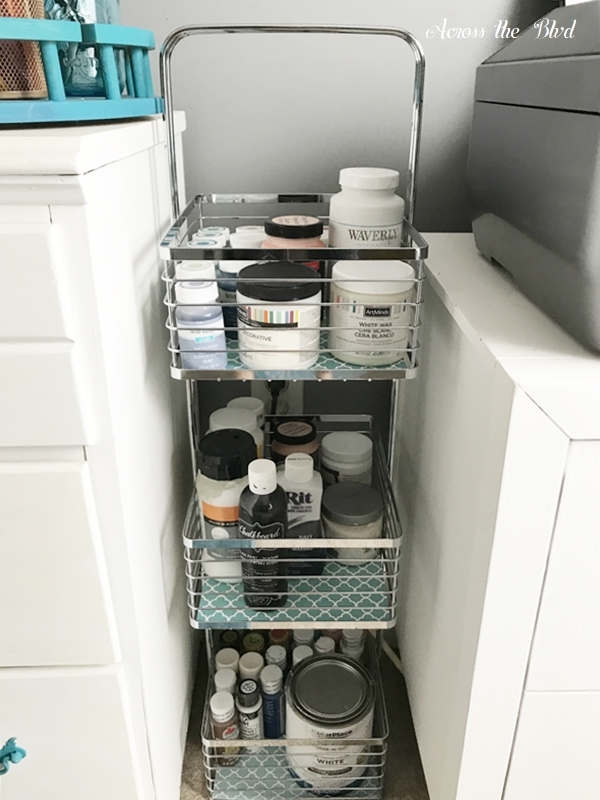 I can live with bins and storage containers even though they aren’t that great to look at if it means I can keep the surface areas of the desk well organized. 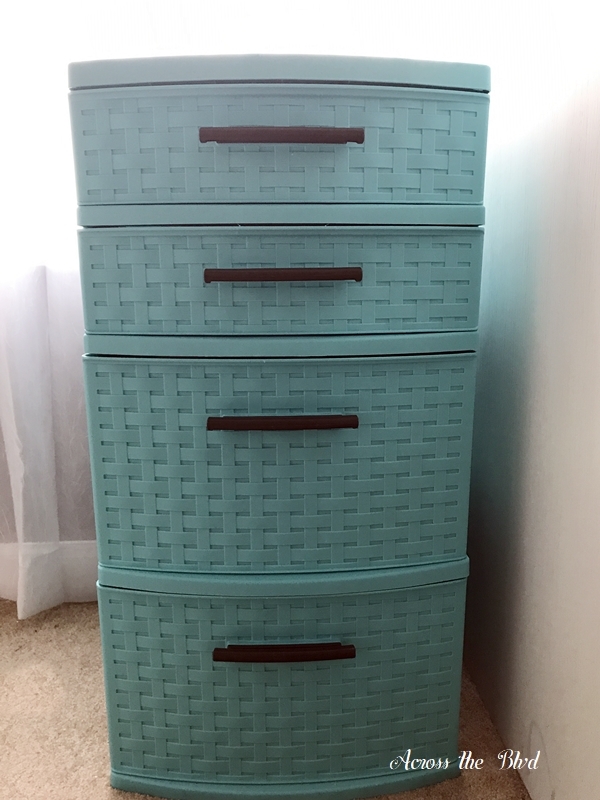 I found this drawer storage at Target recently in the perfect color for the room. Every crafter I know has ribbon. Lots and lots of ribbon. Storing ribbon so that it’s easy to get to has been a challenge for me. 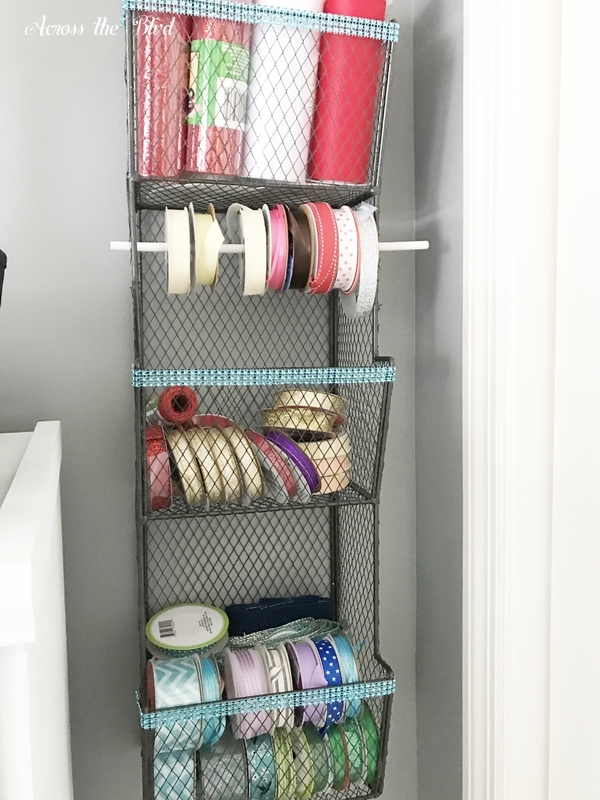 A couple of years ago I bought a small wall organizer for ribbon. It didn’t hold nearly enough and the dowels would slip out easily causing a cascade of ribbons onto the floor. I gave up on it. I’m using this wall mounted storage rack to hold a lot of my ribbon spools. While I’m not able to just pull the ribbon from the spools, it does keep all of it contained. I also have a storage bin that is full of ribbon, too. I put the ones I use frequently in the wall rack and left the seasonal ribbon in the bin. I added a little bling to it using self adhesive jewel strips. I wanted my paint stash to be easily accessible and I wanted to be able to find what I might be looking for quickly. I found this metal storage unit at TJ Maxx. It’s a good size for the space and it holds lots of paint. To give it a little pop of color, I trimmed down card stock and lined the bottom of each rack with it. Now for the closet! I’m continuing to use storage bins for holding a lot of my craft supplies, but I have reorganized them so that items I use most often are easy to reach. Seasonal items are all grouped together and placed in bins. Since I’m currently crafting for Valentine’s Day, Easter, and spring, those bins are the easiest to get to right now. I’ll change the arrangement of the bins as the year progresses. Along with lots of ribbon, we all have lots of silk flowers! 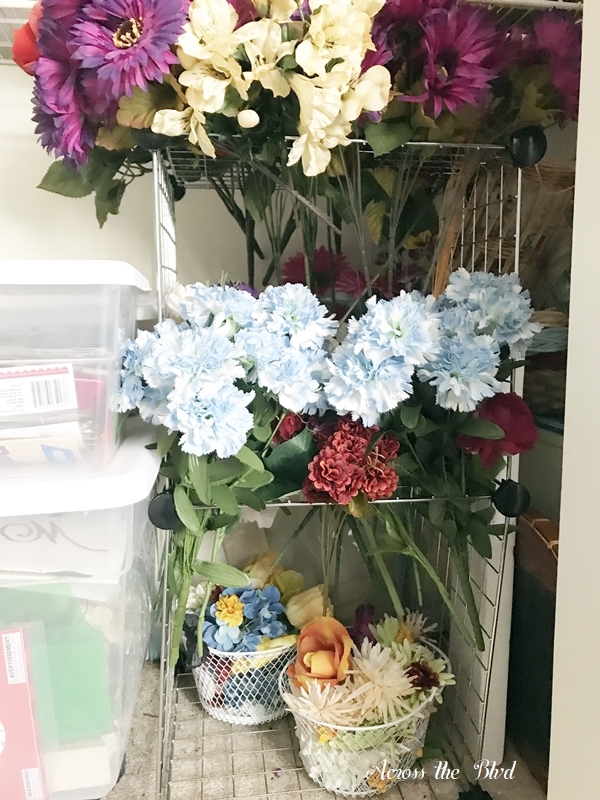 I found a solution to having the flowers stuffed in bins or being strewn about by using a metal cube storage unit that had been disassembled years ago when Gloria moved out. She had used it in her closet, but it’s been gathering dust in our storage room for years. I put together two of the cubes and used the grid to hold flowers. I can quickly see what I have and can pull them out with ease. I placed some stemless flowers in wire baskets that I bought at the Dollar Tree. 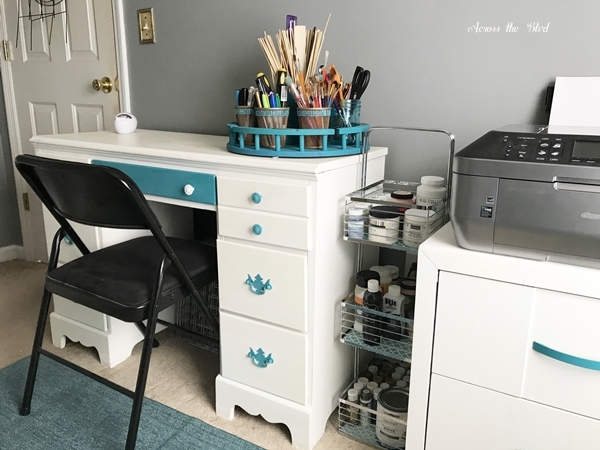 The small desk in the room has deep drawers that hold a lot of my crafting items. Tape, paint, glue, my palm sander, extra glue guns, paper cutter, and cleaning supplies are stored in the drawers. Keeping the surface area clear with only the Lazy Susan on top gives me lots of room to work. The only thing that I haven’t found for the space yet is a chair for this desk. I’m using a black folding chair until I find just what I want. 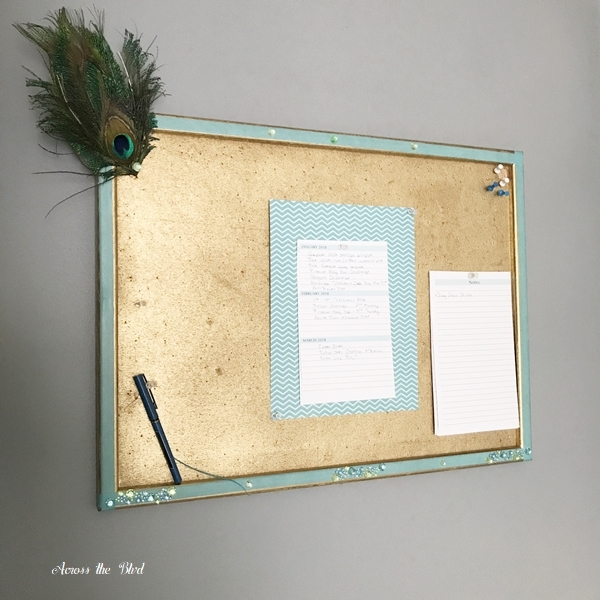 I gave a quick makeover to an old bulletin board using washi tape, a peacock feather, and adhesive jewels. I added some note pages and I use it for reminders. It’s a good place for me to glance at to see what I’ve got upcoming that I need to give my attention to. It’s uncluttered at the moment, but I doubt it will stay that way! I always have a few spare wreath forms on hand and finding a place to store them in the closet wasn’t working. 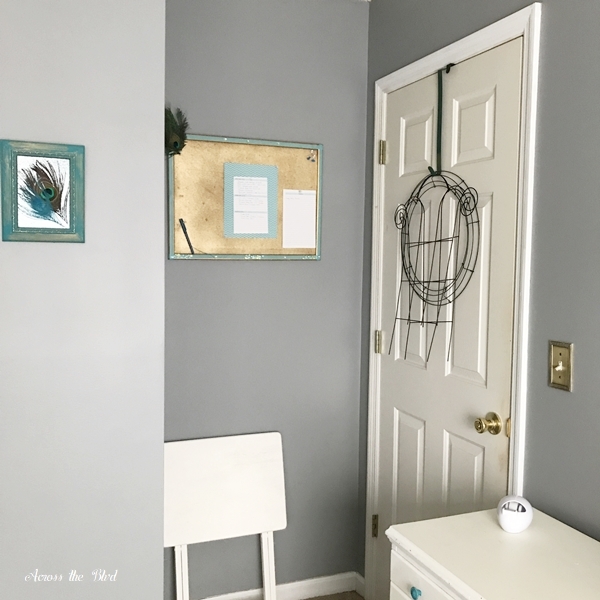 Adding a wreath hanger over the door to the room gives me a place to keep them that’s out of the way and with the door open, out of sight, too. I can’t say that everything is in a perfect spot or that there won’t be some ongoing changes to the space, but considering how it looked when I started, I’m more than happy with the space now. Changing out some furniture, painting old pieces, and adding storage containers and decorative pieces all help to make the room one that I now love to work in. Thanks for following along with this work in progress! I hope you found a tip or two that will give you some ideas! Beverly, I just love your makeover, especially your colors. That basket weave storage bin is adorable! What a fun find. I have a soft spot for Peacock feathers since those were my daughter’s wedding decor and I LOVE your wreath on the wall over your desk. I like your creativity with the silk flower storage. I always have some of those too. I totally agree with you, the craft/office room will always be an ever changing project and that’s kind of fun. Thanks so much, Shirley! I was happy to have found that bin in the right color at Target. I enjoyed putting this room together and the peacock theme turned out as I had hoped it would. 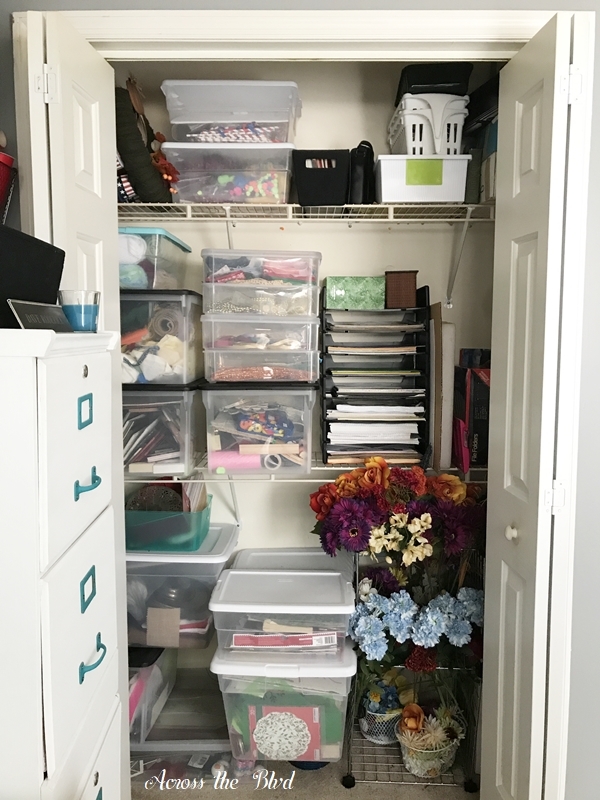 I know that I’ll be tackling the storage closet for a better look in the future, but yes, it is fun to have a space that can be an ongoing project. You are so inspiring! I get somewhat organized and then not really. I forget where I put certain things and I have to make a mess finding it. Love your office. Thank you, Carol! That just made my day! I’m delighted to have inspired you. 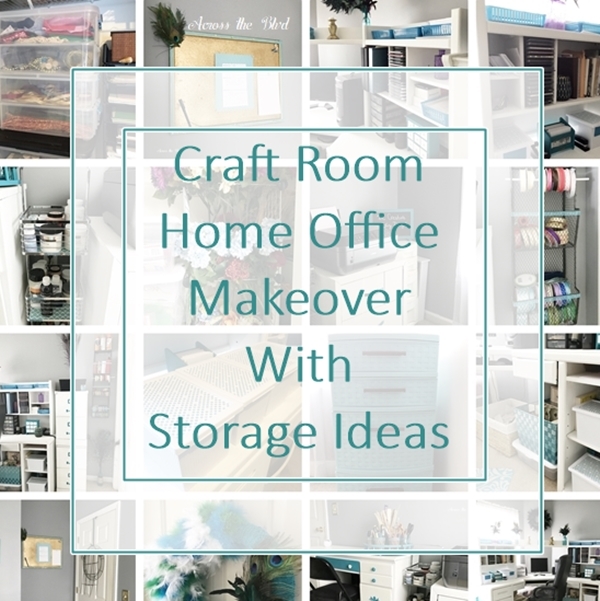 It can be daunting to get started with organizing our craft spaces, but it’s so worth it once it’s done. Beverly, Love your organization! I’ve been trying to ‘contain’ all my crafting supplies and you’ve given me a few ideas! I thought I was pretty organized until it took me 2 hours to find a small jar of paint that I wanted to use. I ended up finishing the project without it and only then did I actually find the paint! I’ve decided it’s time to try to use up what I have before I buy new (not likely!) Just have to ask – what do you do with your finished projects? Thank you, Laurie! I’m so glad to have given you some ideas! I’ve been there trying to find paint or ribbon or that little trinket that I want to use…it’s frustrating. As to my finished projects, I have lots of them, especially the coastal ones in use throughout the house. Sometimes I gift them to family/friends. I’m fortunate to have a large storage room off of our master bedroom closet that holds tons of stuff. All of my seasonal decor is stored there as well as seasonal crafts and wreaths. 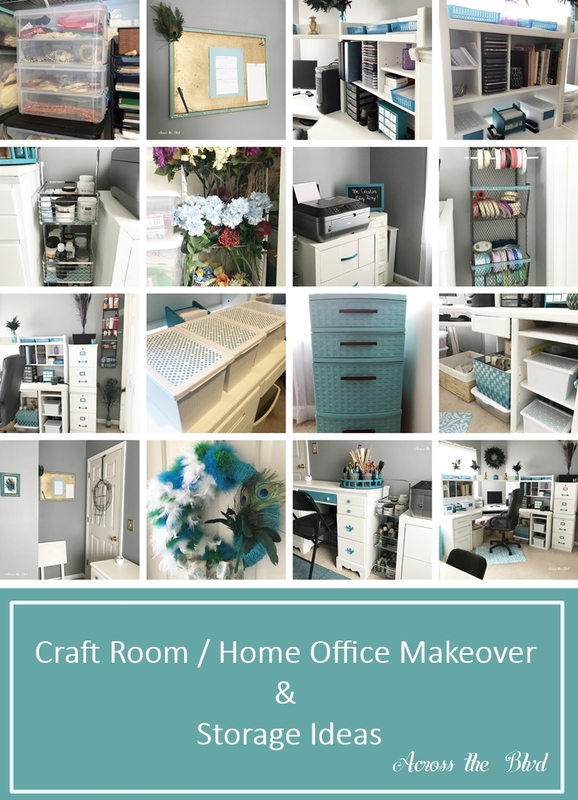 I love craft room makeover! This is my first year with a dedicated usable craft room. I can tell how much work and thought you put in to organizing this space. Such great ideas too. Using the card stock to make things look cohesive and special. The flower rack, that’s super smart, i going to seal that. the wreath hook too, but out in my shop for all the garden stuff that gets pulled out every fall. Thank you, Lorin. It was a big task to undertake, but I’m pleased with how it came out. Glad to have given you some ideas! Thanks, Linda! I’m delighted that you can use some of my tips! Love the refresh. 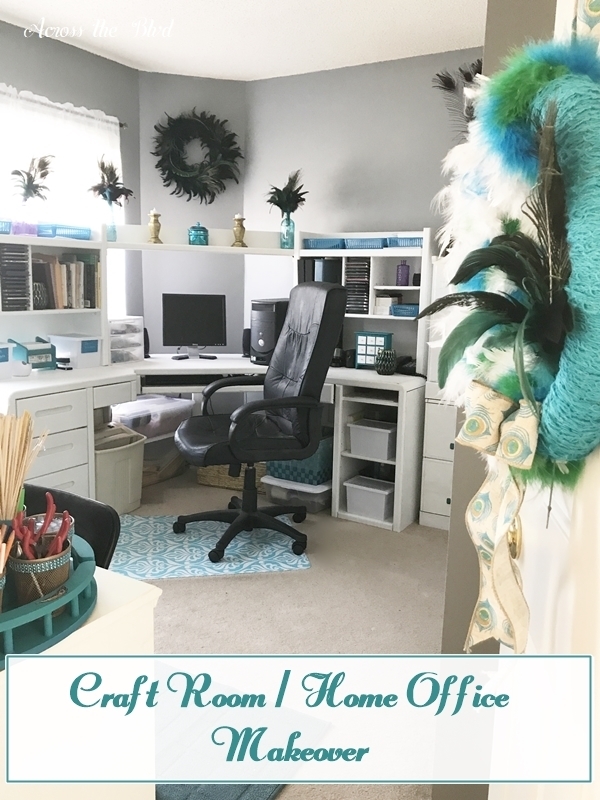 My office/crafting space is all in one room as well and I am always refreshing, adding and, purging in an effort to keep the small space organized and pleasing to the eye. You did an excellent job and I love the pop of color you used throughout. Thank you for sharing with The Blogging Grandmothers. I have shared on social media. Thank you, Clearissa! It’s definitely an ongoing process to keep the space organized. Thanks for the party and for the shares. 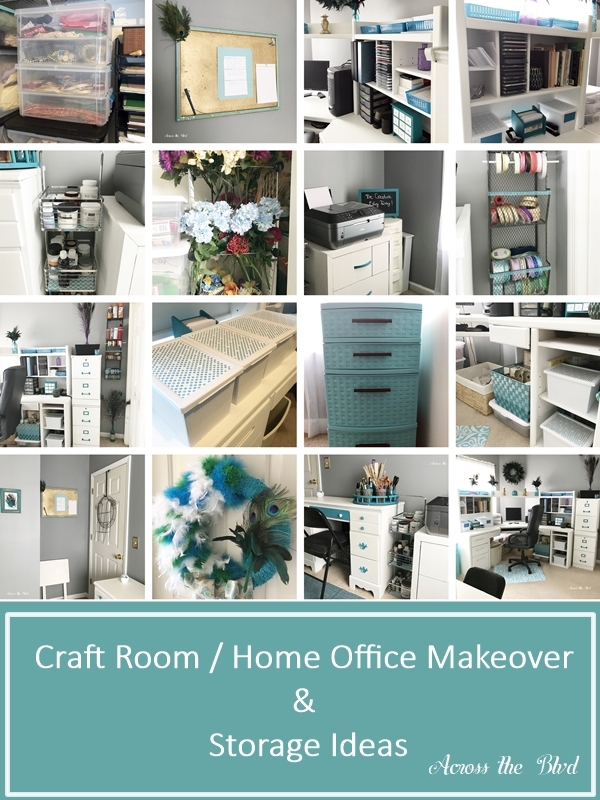 Your craft room/office looks fantastic! 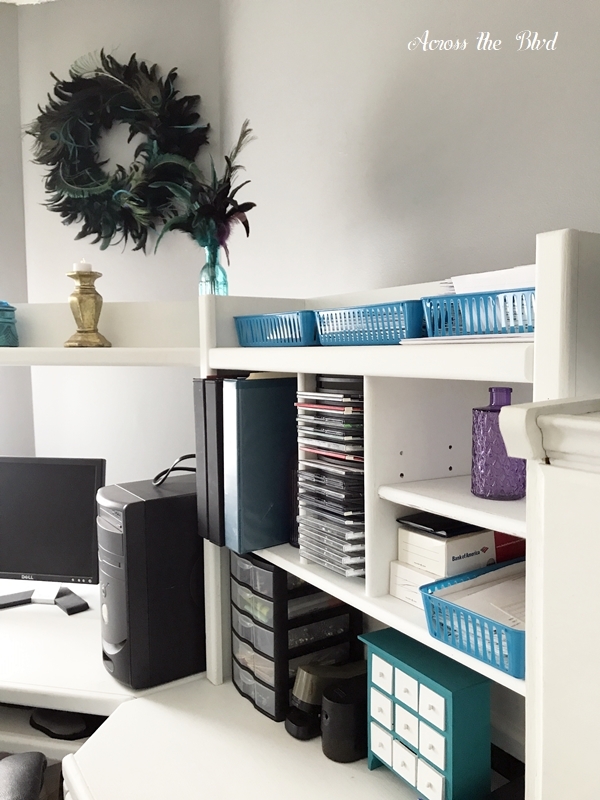 I love all of the pops of teal, and you have so many great organizing solutions! Thanks for linking up with Merry Monday. I’ll be featuring your makeover at our party that kicks off tonight. We hope you’ll come back and link up again! Thanks so much, Emily! I’m enjoying the new look of the space and the organization is working out well. I’m excited to have been chosen as one of your features. Thank you!